Raise your hand if you’ve immersed yourself in holiday baking this season! The baking craze is in full swing in my house, but I’ve been keeping it simple this year. Easy, no-bake recipes are my jam right now. I have made these Oreo Balls a few times in the past few weeks.. This is the first holiday season that the irresistible Chick-fil-A Peppermint Milkshake has been on my radar (and in my belly). I cannot believe I’ve been missing out on this deliciousness. And I’m happy to have it in my life! There is something about having a nice long BEAUTIFUL fall that makes impending winter not seem so terrible. I had to dig the boys' hats and mittens out of a box in the garage this morning and it got me excited for snowmen, cocoa and skiing! A crying boy sits to my right. A jabbering boy sits in front of me. A lawn mower is cruising around right outside my window. I just lost almost an entire post after a computer crash. I'm not letting the distractions stop me, though. I am determined to make a dent in my pile of work today. My gorgeous and wonderful husband passed his skydiving course this week, so the little boys and I are very proud of him and his efforts! It was a long and grueling week for him. This weekend I plan to take the boys out to our camper at the dropzone for the first time.. This recipe will have you licking the bowl, the pan, the spoon and your fingers! Delicious frosting with chopped up cookies . I promise, no crumb left behind! Cookies 'n cream is my favorite ice cream flavor in all the world. Oh, wait. Make that, my favorite ice cream flavor right alongside Ben & Jerry's Half Baked and Cherry Garcia and also the Butterfinger "tornadoes" my dad used to make for me growing up. Ok, so cookies 'n cream is one of my favorite ice cream flavors. Nonetheless, I adore it. So when I ran across this recipe (thanks, lovefromtheoven! ), it took me less than a second to realize I was going to make it. ASAP. Start by making a batch of brownies in a 9x13 pan, prepared according to the package directions. Once the brownies have cooled, use the rim of a glass to "cut" out twelve brownie rounds. Don't toss the brownie remnants! I have an idea that I'll tell you about in a bit. 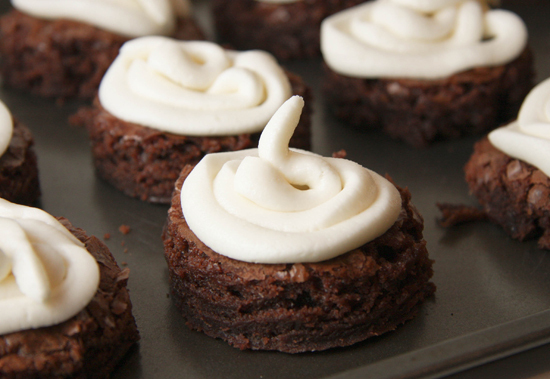 Place the brownie rounds on a serving platter or cookie sheet, and prepare a batch of vanilla buttercream frosting. Spoon the frosting into a large ziploc bag and snip 1/4 inch from one of the corners of the bag. Squish the frosting down and through the snipped hole and cover each brownie with a layer of the frosting. Place 12-15 Oreo cookies in a large ziploc bag and smash them. I prefer fairly big smashed cookie chunks, but if you prefer a finer cookie texture, process them in a food processor or just do a lot of smashing. Place the crumbles on top of the frosting and enjoy! Then grab your brownie scraps and whip together a batch of Cookies 'n Cream Brownie Chunk ice cream! And after that, eat nothing but lettuce and water for 5 days. This recipe will have you licking the bowl, the pan, the spoon and your fingers! No crumb left behind! Allow brownies to cool completely. Using the rim of a glass, “cut” out 12 brownie circles and place them on serving tray. Top each brownie with vanilla buttercream frosting and Oreo crumbles. Decorate each brownie with one whole Oreo cookie, if desired. Click here for a printable recipe!